Every year since our first Halloween feature in 2011, costumes have played a part but the popularity of pet costumes exploded last year. I suspect Instagram, fake news or a general madness is to blame. This year Halloween, Howloween or Meowloween spending will hit 9 billion. Holy meow, Bat Cat. Pet costumes will account 440 million. Are you one of the 20% who will buy your cat a costume? 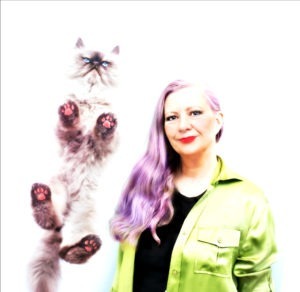 There are some creative crafty types on Instagram who make their own costumes or opt for a minimalist approach. Ready, set and booooo. Our worst picks aren’t horrible designs but they are cheaply made in China of polyester. Safety comes first. 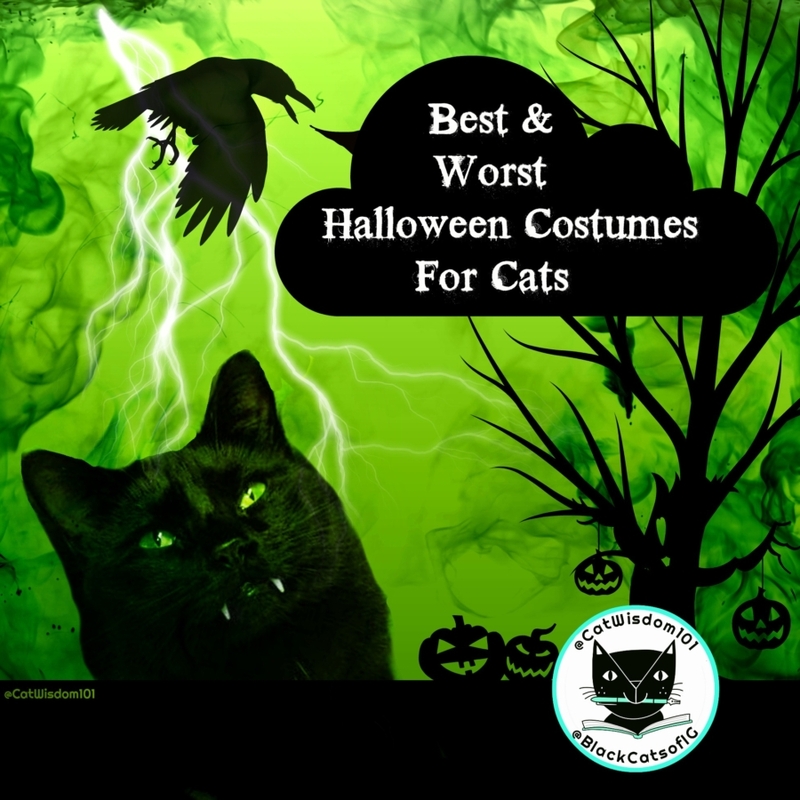 If your cat let’s you dress them up without turning into the devil, count yourself lucky, but do take a peek at our Halloween Safety Tips, and stay on the safe side. Batman remains a perennial favorite for kids but how about Bat Cat? This is fairly minimal and on the positive side, the ears are uncovered. Cats hate having their ears squished. It’s impairs their hearing and balance. If you insist on a heavy duty costume, that means just enough time for a supervised photo shoot. To see details of the first three, click on the photo. They are Amazon affiliate links. The rest are all from Instagram where #halloweencats are going wild. #halloweencoutdown is in full force and #blackcatawarenessmonth is happening. This pumpkin puss leaves the ears exposed and the collar looks soft. Hello, is there a vet in the house? Somebody got scratched. 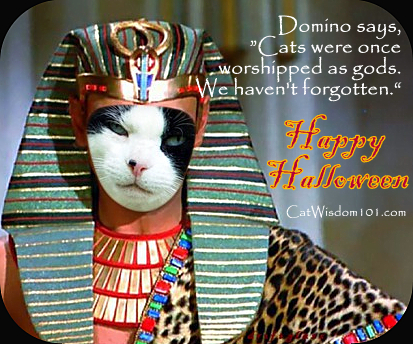 Our favorite cat costume from the crypt, I mean archives, involves no discomfort. It’s all photo editing. Any Bob Ross fans? This covers the ear but is too stinking cute. All of them witches. Who needs a costume when a hat will do the trick? Nothing beats cat-mom made couture. The cat with the biggest wardrobe is the dashing tuxedo, Badger. We used to call fashionable men, peacocks and this bespoke peacock is very swish indeed. The always bewitching Ledges. She has a stunning feature in our Black Cats Tell All book but really has some gorgeous looks this year. The easiest non-costume costume is a decorated collar or simple bow tie. Aren’t you a little bit jealous of this dude’s wardrobe? Check out all his looks on Instagram and his fursibs. There are nine cats and the foster kittens! With fangs like these, Dracula is a shoe-in for another black beauty featured in our book. I’ve left the best for last. Sometimes abstract minimalism is what a cat really wants. With the mid-term elections fast approaching, isn’t it time for a return of #trumpyourcat? Cats should always have the word. This gets our vote for most original Cat Halloween Costume. Who gets your best costume vote? Those are fun costumes and not-costumes!! I once dressed Jabberwoky Glitter in witch’s garb including a handmade Quidditch Golden Snitch for a costume contest at our cat show. She didn’t win but I think the judges just didn’t know what Quidditch was. Andre, that sounds fabulous. Do you have a photo? I’d love to see it. Alice is smart and we’ll stop by. Only 2 weeks left! How cool that you used my pal Badger! I have tons of costumes this year… and I actually enjoy wearing them. Great costumes. I will have to put my 13 cats in their costumes on Instagram. These are all great.